After a lackluster few seasons, the expectations for this season’s nine rookies on the Women's Lacrosse team are considerable. The Harvard women’s lacrosse team has a storied history. The Crimson won 12 Ivy League titles in 13 years between 1981 and 1993 and picked up an NCAA championship in 1990. Recently, though, Harvard’s status of old as a league powerhouse has seemed more and more like a distant memory. Over the past five seasons, Harvard has posted a record of 39-40. In fact, the Crimson has only registered a winning record in the Ivy League six times since its last conference championship 24 years ago. All but one of those winning seasons in-conference came in the last six seasons, with the Crimson making an appearance in the league tournament in each of those years. In short, Harvard’s fortunes seem to be turning around. Recruiting has played a huge part in the team’s improvement. Since 2011, head coach Lisa Miller has brought on 28 high school All-Americans. In 2014, the team’s incoming freshmen—now seniors—were ranked the seventh-best recruiting class in the nation. That group of rookies has made its worth felt, posting an overall winning record since their arrival and qualifying for three-straight Ivy League tournaments. But Miller’s requirements for recruits go beyond rankings and on-field accomplishments. “[I look for players who], beyond their lacrosse skill and athleticism, are team-first kids, incredibly loyal to each other, enthusiastic, never quit, are willing to learn, love to dive in and compete, and my favorite, laugh when they fail and go right back at it,” Miller said. The formula seems to be working, with all of the program’s winning conference records in the last 20 years achieved by teams composed by Miller and her staff. As such, the expectations for this season’s nine rookies are considerable. The rookies will likely have the greatest impact at attack. Although the team lost a number of key defenders to graduation, the freshman class includes only a single listed defensive player in Tate Green. Fellow rookie Jackie Cuccurullo is named as a midfielder but has seen time at defense this season. The first-year hails from Smithtown, N.Y., where she won three consecutive all-county honors and was voted all-division once. Meanwhile Green, a Skaneateles, N.Y., native, garnered three academic All-American honors in high school while picking up 210 ground balls. She also boasts a 70-percent success rate on draws. 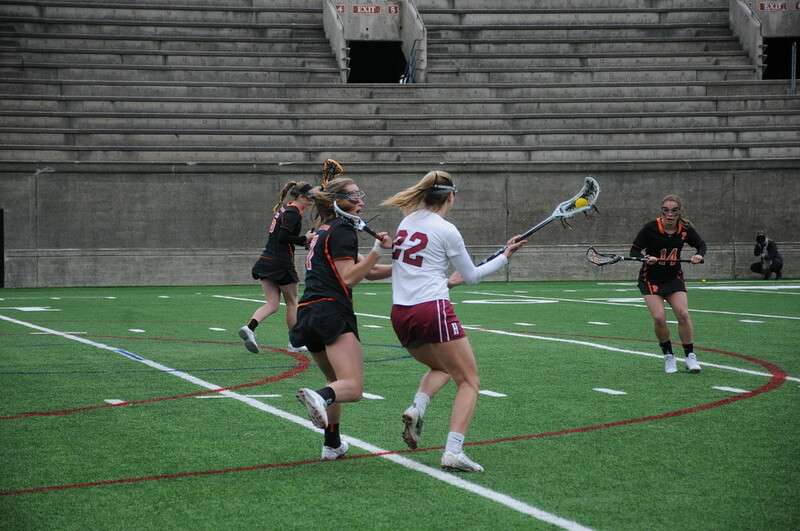 Along with Cuccurullo, the rookie defender will likely be called upon right away this season, as the graduation of co-captain and defensive standout Tory Waldstein ’16 left a spot open in the Harvard back line. Green’s skill with draw controls will be valuable for the Crimson, which was third-worst in the Ivy League in that category last season. Excluding the two defensive-minded players, the rest of the rookie spots are devoted to three midfielders and four attackers, brought in to bolster an already potent offensive unit.